I can't code a proper 3D rotation to save my life, but if you need wrangling at an unhealthy level of precision over words, call me. Mostly I'm just curious about the game-feature implications of calling these things "colonies," and wondering if there's any functional distinction between "city" and "colony" planned for LT. I love hearing this. 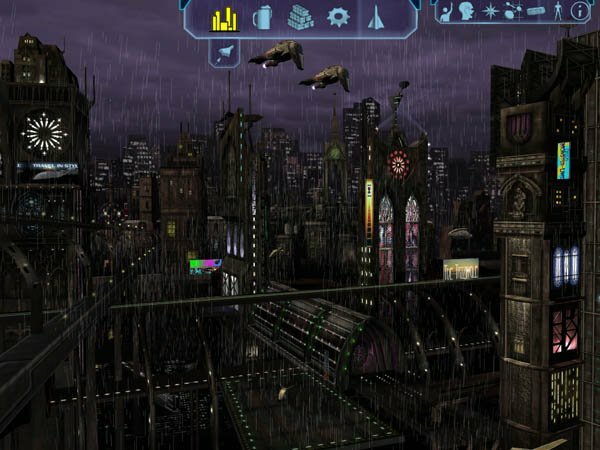 This means the procedural planetside city generation could be very interesting indeed. AND, in the interest of getting people to post more pictures, I'm going to post a number of Freelancer favorites. Don't like them? Give me some good examples of stuff you do like, people. We have plenty of time. This one shows all the hallmarks of being hand-modeled - odd building shapes, supporting struts, external frames, etc. But it looks pretty. Then again, I've always been an ice planet kind of guy. Ahhh, Manhattan. If you've played Freelancer at all, you've seen this one. To be honest, I don't particularly care for this city design - there's something about not being able to see any walkways that doesn't appeal to me. (I've always loved walkways, streets, etc.) Not sure which planet this is from - I'm pulling them off google images. I like it, though. 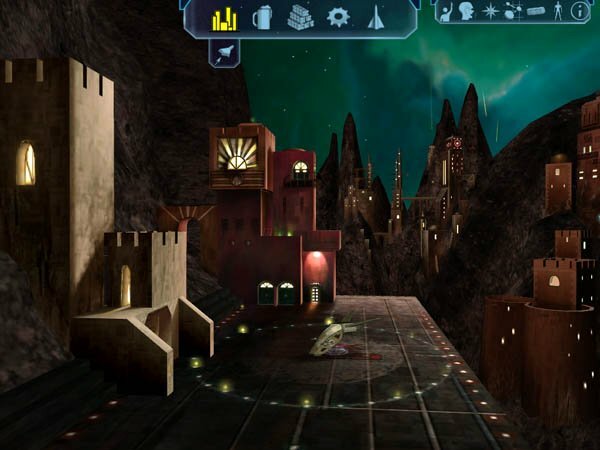 I suppose it's partially the almost medieval-style buildings combined with the dark rock, combined with nighttime. It looks peaceful and hidden. Here's another good one from Freelancer. It's actually pretty simply built, but the way the buildings get taller in the background really appeals to me - very strongly. It gives you the sense that yes, this city extends farther than you're actually seeing - it makes it feel larger and more grandiose. The rain, of course, is a gorgeous touch that I'd love to see LT have, but rain is a problem all its own. Three things I'd like to point out in this one (and yes, it's another ice scene). First, the camera angle is gorgeous - aiming upwards towards the clouds, with the sunlight focused behind the buildings. Second - clouds. I'm sure Mr. Parnell could quickly throw something together to believably generate clouds, given how he's already got nebulae working. (Interesting fact: When artists draw fictional nebulae in real life, they very often draw inspiration from real-world clouds.) And finally - look at how simple these buildings would be to generate. They're essentially layers of blocks with other blocks stuck through them, and yet it looks great. Textures might be a bit more difficult, but hey. Here's another great one. Let's point out a few things. First, yes, I love rain. Second - the colors in this are really eye-catching, and give it a futuristic feel. 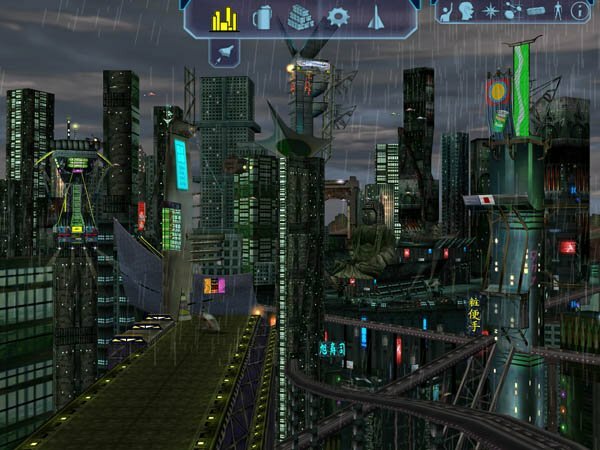 It would be really useful for Mr. Parnell to familiarize himself with ways to make things look "futuristic" - so we could get high-tech planets that really look like something from the future. (Come on, guys, let's help him out.) And finally, look at those roads in the foreground, curving off into the city. No, look at them - they don't actually go anywhere - one of them even goes straight through a building - and yet I bet you didn't notice until I pointed it out. I'm not sure what to make of that, but I bet that trick could be utilized. I'd personally call them all cities. That's how they'll look anyway. Josh can call them what he likes now he's confirmed what he intends doing. I'm just happy were going to get something more exciting than a group of huts around a duck pond or a sand pit. Victor Tombs wrote: Josh can call them what he likes now he's confirmed what he intends doing. I'm just happy were going to get something more exciting than a group of huts around a duck pond or a sand pit. Actually, I wouldn't mind seeing a few low-level colonies. Seeing a vast ecumenopolis on every planet you land on would get boring. 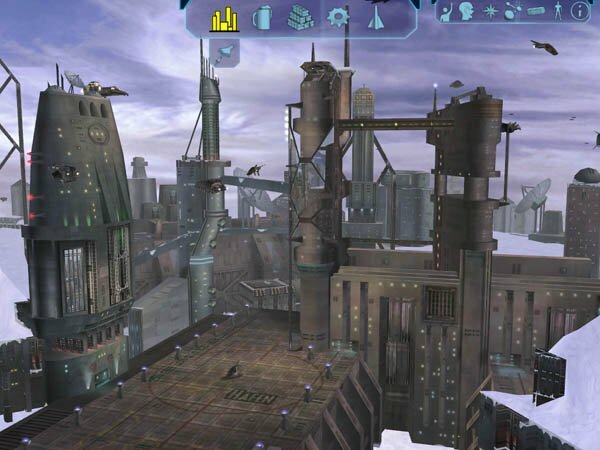 Having some that are industrial zones (like Pittsburg in Freelancer), overgrown bases and landing sites (like Dxun in KotOR II), or small trading posts/government outposts on agricultural worlds (like the Jedi Enclave on Dantooine in KotOR I) would create a more interesting variety. I'd call the planet a planet, and anything on it can be generalized to a "settlement." What the type of settlement could be based on its GDP/population/primary exports. You could have mining towns, industrially-driven cities, commercial headquarters, tourism destinations, agricultural villages, vast plantations, seaside fisheries, pioneer camps, Coruscant-style ecumenopoles, military outposts, and whatever the space equivalent of a truck stop is. Settlement works. And I think you should be able to see small village-like colonies right when they start out, too. I agree with absolutely everything you said there, Grumblesaur. Also, really looking forwards to hearing Mr. Parnell say something about civilians, now that he's working on relevant stuff. Grumblesaur wrote: Actually, I wouldn't mind seeing a few low-level colonies. Seeing a vast ecumenopolis on every planet you land on would get boring. 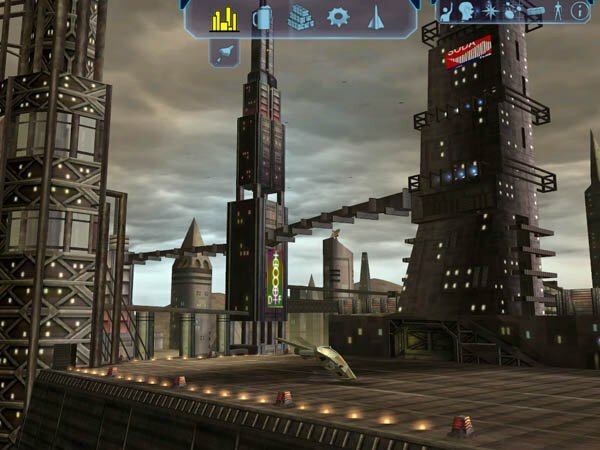 Having some that are industrial zones (like Pittsburg in Freelancer), overgrown bases and landing sites (like Dxun in KotOR II), or small trading posts/government outposts on agricultural worlds (like the Jedi Enclave on Dantooine in KotOR I) would create a more interesting variety. Of course I want to see that sort of variety, Grumblesaur. As you say, it's attention to those sorts of detail that will make the game interesting. We had it in the original Freelancer so I'd like to see a similar mix in Limit Theory. I was more concerned that it would ALL be small scale developments containing very little but the places necessary to do business. Talvieno wrote: Also, really looking forwards to hearing Mr. Parnell say something about civilians, now that he's working on relevant stuff. He toys with us, Talvieno. Take every opportunity you get to remind and persuade the coding maestro. "Settlement" was the catch-all term I used in my earlier comment in this thread, so it works for me, too. I still wouldn't mind seeing a functional distinction made between city and colony, though. That word "colony" has a lot of useful connotations. I though adding some mining colony ideas might help fuel your creative fluids. 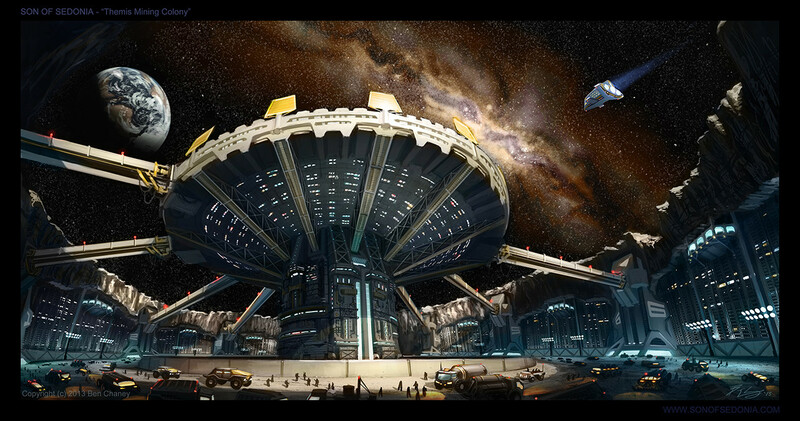 First up and as I mentioned fluids...the below kind of a design, with your main mining station taking centre stage surrounded by outer facilities/landing zones make for an interesting look. I can see similar mining facilities leaving room for Josh's procedurally-generated countryside tech filling in the surrounding area; basically this facility doesn't have to be surrounded by a fluid, if you get my drift. Next up, I like the idea of landing kind of offsite in the foreground with the industry/mining operations in the background, be it in a mountain/canyon or far off distance. What also stands out are the big freighter or cargo vessels drifting above the facilities. It does make the whole scene come over as alive and productive, can't link to the image unfortunately. The next two can probably me mentioned in the same breath. What I like about these are that they are placed in a crater like valley and the command post's taking centre stage with walkways or support beams running into the surrounding ridges. It makes the scene easier to recreate for multiple mining planets in a sense, if you surround it with differently textured surrounding mountains/ridgelines. Lastly, just a link to some more ideas for cityscapes, I'm not going to spam each one here, but I think there are some good ideas hidden in these scenes. That's all from me for now, see you guys around. Very nice examples! Welcome to the forums, Yawyk, you certainly made an entrance. Here's a smaller version of that missing image: I don't know much about Stargate Atlantis (never could get into it myself, though I loved SG-1). 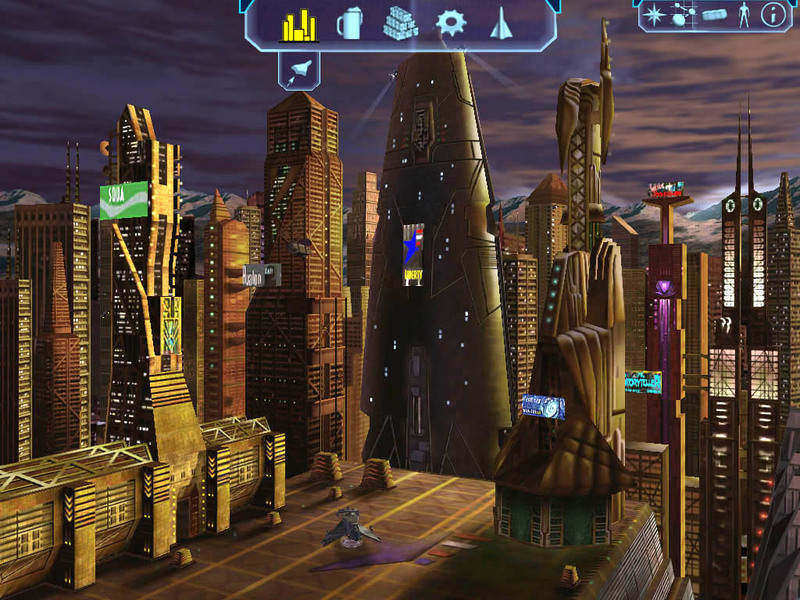 I love their city design, though - especially the landing pads (like you said) and the spires in the center. The whole "outlying flat areas" and "tall inner areas" thing is something I really appreciate, like a sort of like this sort of thing that I nabbed off google images: but not quite. That general idea. Buildings built onto the side of a mountain - love it! If we could see a base like that it would be amazing, provided Mr. Parnell is okay with faking a mountainside. lol Buildings built into a crater wall - even better, maybe for lava planets or some such. I also love the complexity of that foreground in the third image. I didn't see where he said that? Talvieno wrote: I didn't see where he said that? Yawyk wrote: First up and as I mentioned fluids...the below kind of a design, with your main mining station taking centre stage surrounded by outer facilities/landing zones make for an interesting look.